Definition at line 148 of file llui.h. Definition at line 112 of file llui.h. Definition at line 199 of file llui.h. Definition at line 736 of file llui.cpp. References cosf, f, F_TWO_PI, glBegin, glEnd, glPopMatrix, glTranslatef, glVertex2f, sinf, x, and y. Definition at line 779 of file llui.cpp. References f, F_TWO_PI, glBegin, glEnd, glPopMatrix, glTranslatef, glVertex2f, x, and y.
Referenced by LLPieMenu::draw(), LLManipRotate::render(), and LLManipRotate::renderSnapGuides(). Definition at line 379 of file llui.cpp. References glBegin, glEnd, llmin(), and S32. Definition at line 413 of file llui.cpp. References LLImageGL::getHeight(), LLImageGL::getWidth(), and gl_draw_scaled_rotated_image(). Referenced by LLButton::draw(), LLFloaterColorPicker::draw(), LLFolderViewItem::draw(), LLJoystickCameraRotate::draw(), LLJoystickCameraZoom::draw(), LLNetMap::draw(), LLResizeHandle::draw(), LLToolGun::draw(), LLWorldMapView::drawAvatar(), drawDot(), LLWorldMapView::drawImage(), LLWorldMapView::drawImageStack(), and LLScrollListIcon::drawToWidth(). Definition at line 605 of file llui.cpp. Definition at line 418 of file llui.cpp. Referenced by LLButton::draw(), LLComboBox::draw(), LLFloaterAuction::draw(), LLFloaterPostcard::draw(), LLFloaterSnapshot::draw(), LLIconCtrl::draw(), LLPanelLogin::draw(), LLPreviewTexture::draw(), LLFloaterTexturePicker::draw(), LLTextureCtrl::draw(), and LLTextEditor::drawText(). Definition at line 656 of file llui.cpp. References LLImageGL::bind(), f, glBegin, glColor4fv, glEnd, glPopMatrix, glTranslatef, llendl, llwarns, LLColor4::mV, and NULL. Definition at line 423 of file llui.cpp. References LLImageGL::bind(), f, LLImageGL::getHeight(), LLImageGL::getWidth(), glBegin, glColor4fv, glEnd, glPopMatrix, glTranslatef, llendl, llfloor(), llmin(), llwarns, LLColor4::mV, NULL, S32, and stop_glerror. Referenced by LLButton::draw(), LLConsole::draw(), LLProgressView::draw(), LLScrollbar::draw(), LLSlider::draw(), LLButton::drawBorder(), and LLManip::renderXYZ(). Definition at line 610 of file llui.cpp. References LLImageGL::bind(), f, glBegin, glColor4fv, glEnd, glPopMatrix, glRotatef, glTranslatef, llendl, llwarns, LLColor4::mV, and NULL. 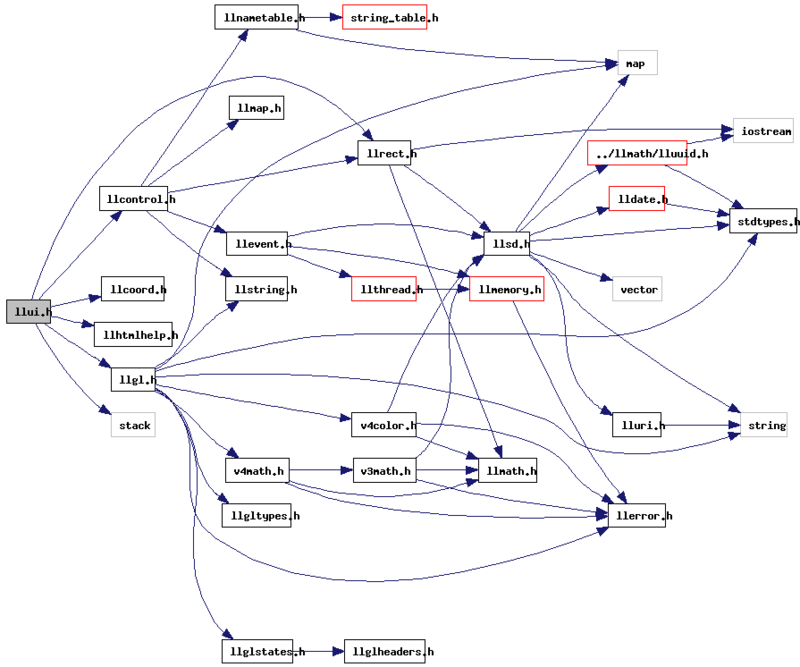 Referenced by LLFolderViewItem::draw(), LLTracker::drawMarker(), LLWorldMapView::drawTrackingArrow(), gl_draw_image(), gl_draw_rotated_image(), and gl_draw_scaled_image(). Definition at line 147 of file llui.cpp. References glBegin, glColor4fv, glEnd, LLRectBase< Type >::mBottom, LLRectBase< Type >::mLeft, LLRectBase< Type >::mRight, LLRectBase< Type >::mTop, and LLColor4::mV. Referenced by LLColorSwatchCtrl::draw(), LLFloaterTexturePicker::draw(), and LLTextureCtrl::draw(). Definition at line 257 of file llui.cpp. References glBegin, glColor4fv, glEnd, LLColor4::mV, stop_glerror, and VALPHA. Referenced by LLAlertDialog::draw(), LLFloater::draw(), LLSnapshotLivePreview::draw(), LLMenuGL::draw(), LLModalDialog::draw(), LLStatusBar::draw(), and LLTextBox::draw(). Definition at line 338 of file llui.cpp. References gGLManager, glBegin, glColor4fv, glEnd, LLGLManager::mATIOffsetVerticalLines, and LLColor4::mV. Definition at line 319 of file llui.cpp. References gGLManager, glBegin, glEnd, and LLGLManager::mATIOffsetVerticalLines. Definition at line 248 of file llui.cpp. References gl_rect_2d(), glColor4fv, LLRectBase< Type >::mBottom, LLRectBase< Type >::mLeft, LLRectBase< Type >::mRight, LLRectBase< Type >::mTop, and LLColor4::mV. Definition at line 127 of file llui.h. References gl_rect_2d(), LLRectBase< Type >::mBottom, LLRectBase< Type >::mLeft, LLRectBase< Type >::mRight, and LLRectBase< Type >::mTop. Definition at line 241 of file llui.cpp. References gl_rect_2d(), glColor4fv, and LLColor4::mV. Definition at line 186 of file llui.cpp. References gGLManager, glBegin, glEnd, LLGLManager::mATIOffsetVerticalLines, and stop_glerror. Definition at line 861 of file llui.cpp. References f, FALSE, first, gl_rect_2d(), glPolygonStipple, i, j, S32, and TRUE. Referenced by LLColorSwatchCtrl::draw(), LLFloaterImagePreview::draw(), LLFloaterImport::draw(), LLPreviewTexture::draw(), LLFloaterTexturePicker::draw(), and LLTextureCtrl::draw(). Definition at line 132 of file llui.h. References gl_rect_2d_offset_local(), LLRectBase< Type >::mBottom, LLRectBase< Type >::mLeft, LLRectBase< Type >::mRight, and LLRectBase< Type >::mTop. Definition at line 168 of file llui.cpp. References gl_rect_2d(), glPopMatrix, llfloor(), LLCoord::mX, LLCoord::mY, LLFontGL::sCurOrigin, LLUI::sGLScaleFactor, VX, and VY. Definition at line 162 of file llui.cpp. References gl_rect_2d_offset_local(), glColor4fv, and LLColor4::mV. Definition at line 1022 of file llui.cpp. Referenced by LLPreviewAnimation::render(), LLImagePreviewAvatar::render(), LLImagePreviewSculpted::render(), LLTexLayerSet::render(), LLTexLayer::render(), LLTexLayerParamAlpha::render(), LLTexLayer::renderAlphaMasks(), and LLTexLayerSet::renderBump(). Definition at line 1003 of file llui.cpp. References f, glBegin, and glEnd. Referenced by LLColorSwatchCtrl::draw(), LLProgressView::draw(), LLTexLayerSet::render(), LLTexLayer::render(), LLTexLayerParamAlpha::render(), LLVisualParamHint::render(), render_disconnected_background(), LLTexLayer::renderAlphaMasks(), and LLTexLayer::renderImageRaw(). Definition at line 718 of file llui.cpp. References glBegin, glColor4fv, glEnd, glLogicOp, stop_glerror, and LLColor4::white. Definition at line 840 of file llui.cpp. References f, gl_deep_circle(), gl_washer_2d(), glColor4fv, glPopMatrix, glTranslatef, and LLColor4::mV. Referenced by LLManipRotate::render(), and LLManipRotate::renderActiveRing(). Definition at line 1190 of file llui.cpp. References f, glBegin, glEnd, glPopMatrix, glTranslatef, height, llabs(), llclamp(), llmax(), llmin(), LLVector2::mV, ROUNDED_RECT_BOTTOM, ROUNDED_RECT_LEFT, ROUNDED_RECT_RIGHT, ROUNDED_RECT_TOP, S32, VX, VY, width, and LLVector2::zero. Definition at line 1032 of file llui.cpp. References f, glBegin, glEnd, glPopMatrix, glTranslatef, glVertex2f, height, llabs(), llmin(), LLVector2::mV, ROUNDED_RECT_BOTTOM, ROUNDED_RECT_LEFT, ROUNDED_RECT_RIGHT, ROUNDED_RECT_TOP, S32, VX, VY, width, and LLVector2::zero. Referenced by LLFolderViewItem::draw(), LLHoverView::draw(), LLOverlayBar::draw(), LLNotifyBox::drawBackground(), and LLScrollListText::drawToWidth(). Definition at line 1380 of file llui.cpp. References f, glBegin, glEnd, LLVector3::mV, LLVector2::mV, ROUNDED_RECT_BOTTOM, ROUNDED_RECT_LEFT, ROUNDED_RECT_RIGHT, ROUNDED_RECT_TOP, VX, VY, and LLVector3::zero. Referenced by gl_segmented_rect_3d_tex_top(), and LLHUDText::renderText(). Definition at line 1512 of file llui.cpp. Definition at line 132 of file llui.cpp. References f, glOrtho, and stop_glerror. Definition at line 694 of file llui.cpp. References end, f, glBegin, glColor4f, glEnd, glLineStipple, LLColor4::mV, S32, LLUI::setLineWidth(), start, VALPHA, VBLUE, VGREEN, and VRED. Definition at line 359 of file llui.cpp. References glBegin, glColor4fv, glEnd, and LLColor4::mV. Referenced by LLFloaterColorPicker::draw(), and LLSlider::draw(). Definition at line 896 of file llui.cpp. References COS_DELTA, DELTA, F_TWO_PI, glBegin, glColor4fv, glEnd, glVertex2f, LLColor4::mV, and SIN_DELTA. Referenced by LLPieMenu::draw(), gl_ring(), and LLManipRotate::render(). Definition at line 933 of file llui.cpp. References COS_DELTA, DELTA, glBegin, glColor4fv, glEnd, glVertex2f, LLColor4::mV, and SIN_DELTA. Referenced by LLPieMenu::draw(), LLPieMenu::drawBackground(), and LLWorldMapView::drawTrackingCircle(). Definition at line 968 of file llui.cpp. Definition at line 87 of file llui.cpp. References LLUUID::isNull(), llendl, llinfos, llwarns, NULL, LLUI::sAudioCallback, and LLUI::sConfigGroup. Referenced by add_duplicate(), LLTextEditor::addChar(), LLIMMgr::addMessage(), LLFloater::close(), derez_objects(), LLToolDragAndDrop::dropObject(), LLFloaterWorldMap::fly(), LLModalDialog::handleDoubleClick(), LLPieMenu::handleHover(), LLRadioGroup::handleKeyHere(), LLButton::handleMouseDown(), LLFolderViewItem::handleMouseDown(), LLMenuItemBranchDownGL::handleMouseDown(), LLModalDialog::handleMouseDown(), LLSlider::handleMouseDown(), LLTextBox::handleMouseDown(), LLButton::handleMouseUp(), LLMenuItemGL::handleMouseUp(), LLMenuItemBranchGL::handleMouseUp(), LLPieMenu::handleMouseUp(), LLSlider::handleMouseUp(), LLTextBox::handleMouseUp(), LLFolderViewItem::handleRightMouseDown(), LLPieMenu::hide(), LLTextEditor::insertStringNoUndo(), LLPanelFriends::onClickIM(), LLButton::onCommit(), LLFloaterNewIM::onStart(), LLFloater::open(), process_teleport_start(), LLSelectMgr::repeatDuplicate(), LLLineEditor::reportBadKeystroke(), LLTextEditor::reportBadKeystroke(), LLSliderCtrl::reportInvalidData(), LLSpinCtrl::reportInvalidData(), LLScrollListCtrl::reportInvalidInput(), LLSelectMgr::selectDelete(), LLSelectMgr::selectDuplicate(), LLSelectMgr::selectDuplicateOnRay(), LLStatusBar::setBalance(), LLAgent::setFlying(), LLStatusBar::setHealth(), LLFloater::setMinimized(), LLAlertDialog::setVisible(), LLPieMenu::show(), LLPanelGroups::startIM(), LLFloaterWorldMap::teleport(), and LLAgent::teleportCore(). Definition at line 122 of file llui.cpp. Definition at line 67 of file llui.cpp. Referenced by LLLineEditor::draw(), LLTextEditor::drawCursor(), LLViewerWindow::handleFocus(), and LLViewerWindow::handleFocusLost(). Referenced by LLJoystickCameraRotate::drawRotatedImage(), and LLViewBorder::drawTextures().